Pioneer is pretty much a gold standard for DJ controllers. They carry high quality products for all levels from entry to professional. 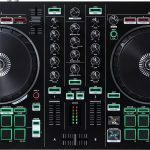 This DJ controller is geared toward semi-professional controllerist DJs who wants to see the live remixing innovations of state of the art controllers. I would suggest this controller to someone who’s been DJing for a while, someone who wants to become a professional DJ. It’s pretty complex and beginners may be a little lost. But it’s absolutely great for learning as well and won’t take too long to pick up. 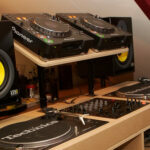 The setup is an asymmetrical two turntable design with one on either side and a two channel mixer in the middle. It comes with it’s own amazing sound card and is USB powered. The DDJSR is smaller and lighter version of the brand’s SX model. It is extremely compact at just over shoulder width allowing for portability and ease of setup for temporary shows. It comes with a rugged steel face plate. On top of that it can probably handle a fall or two without too much issue. Meaning it can handle travel to and from gigs without babying. The sides are a strong and sturdy plastic. It is powered by USB for laptop connectivity with Serato installed. The sound card hosts a monitor headphone output, microphone input, balanced auxiliary inputs, and a balanced output to the PA. The controls all feel like they’re extremely high quality. The wheels are really responsive, smooth and feel durable. The performance pads are very nice, somewhat rubbery but easy and satisfying to press and time with the beat. 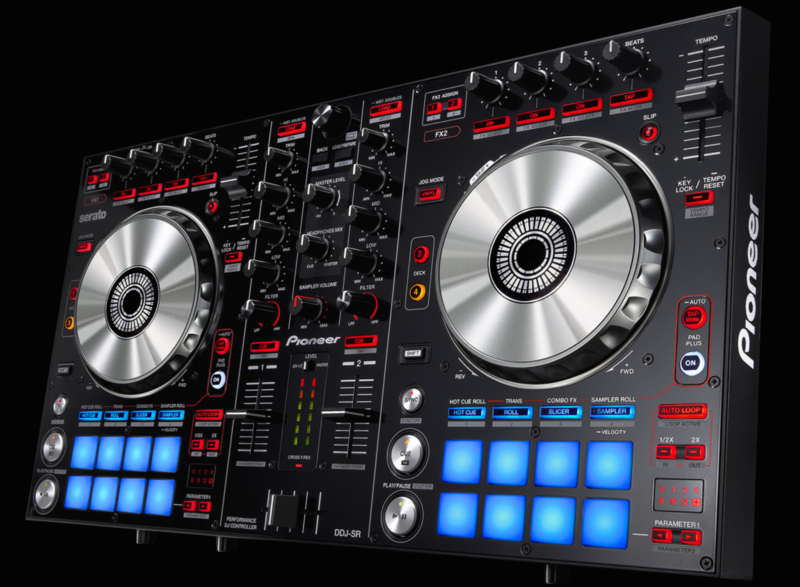 The two turntables are asymmetrical where the layout on both the left and the right are the same, which may throw off some DJs used to a mirrored deck setup. Each deck comes with 8 performance effect pads, four effect selection controls, three FX knobs , a jog wheel, tempo control, and time signature selection. Each deck has a shift key allowing you to moved to a third and fourth deck and control over up to four tracks at once. 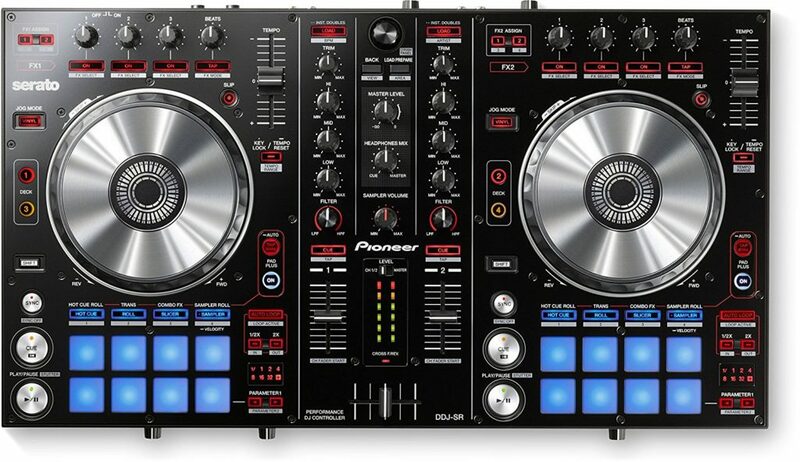 The DDJSR having 4 decks means this product is an amazing next step when moving up from an entry level controller. Though even as a beginner you’ll be able to efficiently and quickly learn the ropes with the software controlled effects to produce a professional sound and performance. The deck’s jog wheels are pretty large and take up a big percentage of real estate on the compact controller. They’re not too big that they overtake it, so it’s actually pretty nice to have due to precision. The wheels also have multiple functionality depending on how you spin them. The top of the wheel allows you to scratch, while the side of the wheel allows you to skip and fine-tune where you are in a track in Serato. A huge plus is the effects are geared towards a live and impromptu environment, having only a cursory understanding of what the effect does is all you need. No additional preparation other than the knowledge is needed as the beat mapping and computer will take control of all the settings. Basically if you keep the phrasing and downbeats of your track intact you’ll find you can do some ridiculously amazing things with this piece of gear effortlessly. You just have to choose the beat lengths. Just keep an eye on the looping length to keep control of the beat with a cursory glance. The most important part to realize is that unlike a loop or roll the slicer allows you to work with parts of the music that haven’t happened yet without impacting the rest of what gets played. You can insert future beats over the track in time with the music. Allowing you to bring in effects before they’ve happened and a whole new dimension to your creativity without ruining the flow of the track. You can add in some pretty awesome buildups and other effects on the fly and really make your show shine easily with this controller. On top of these standard of living improvements for live shows, the DDJSR also comes with Pad Plus. It’s essentially a set of alternative settings to create next level effects. For example the slicer pad plus makes the slicer pads become triggerable effects like reverb fade outs. Once again these effects are all perfectly in sync with the music that can be incorporated at any time. In addition the DDJSR comes with 12 FX software packs and has lots of additional ones for purchase through the app package. You can have up to three active at a time and choose between having one effect that you have full control over 3 parameters of that effect and really deep dive into creating something unique. Or you can go with a much broader strokes with 3 effects being controlled at once. This is done through three FX knobs at the top of each deck. Honestly they take some getting used to as each effect is mapped it’s own way. But for the most part they seem to follow intuitive rules for knob assignment. One of the premium features of this controller is the Slip Mode setting. Essentially what this setting does is allow for the track to continue to progress regardless of what’s done on the controller. So for example if you pause the track in Slip mode, the sound will be paused and won’t play out loud, but the track will keep going quietly on your Serato program. Essentially it mutes the track during loops, scratching, samples, and even “pausing”. So if you put effects on the start and stop of a song you can trigger them without interrupting the song, just by pausing and playing the track. This brings us to the greatest strength of the DDJSR. 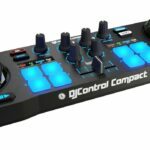 You never have to interrupt your song to create effects.This is why I think it’s the best DJ controller for controllerist DJs as they will see the most benefit. But this controller just makes your performance so damn smooth when everything you do works with the flow of the music instead of in place of it. Whether you’re using Pad triggers, slip mode or FX knobs this controller’s got you covered. As a standard controller staple there’s not much to say about the mixer. Your expected features are there and everything is easy to use, well designed and fine. The mixer comes with trim, EQ and a high and low pass filter for controlling base in your performance. The sound card on this piece of gear is really, really nice and extremely high quality. This is where Pioneer steps up their game. In addition to Serato’s output it comes with inputs for your Mic and Aux in to bring in more sound. The device has a balanced 1/4 jack output to make sure your sound comes out crisp. When I say the sound card is extremely high quality I mean it. It comes with 24 bit sound at a 44.1k sample rate. This means it sounds way better than it’s price point, from deep bass to high high hats. It is greater than Bluray sound quality. For an easy comparison, it’s got 256 times more precision on frequencies than CDs. Take the time to find some lossless tracks and you can blow your audience away with studio quality sound. The USB power is both good and bad. It cuts down on necessary cables and cleans up your play area for sure. But if you have too many USB devices plugged into your computer you can find yourself with power issues that may mess up your setup. If you’re thinking of hooking up multiple USB powered devices to your laptop look into a powered USB hub. 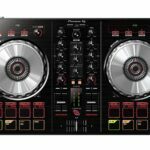 The DDJSR comes with a full version of Serato DJ (Normally $99). Of course it integrates very effectively with the Serato software that comes with the product. It was made for it after all. The software itself is frequently championed as one of the best. It’s extremely stable and has never crashed on me. Make sure your laptop can handle it though. The software lets you set 8 cue points per track. Which just so happens to be the max of this controller. It has my favorite library organization as well with Key, BPM and custom flagging. 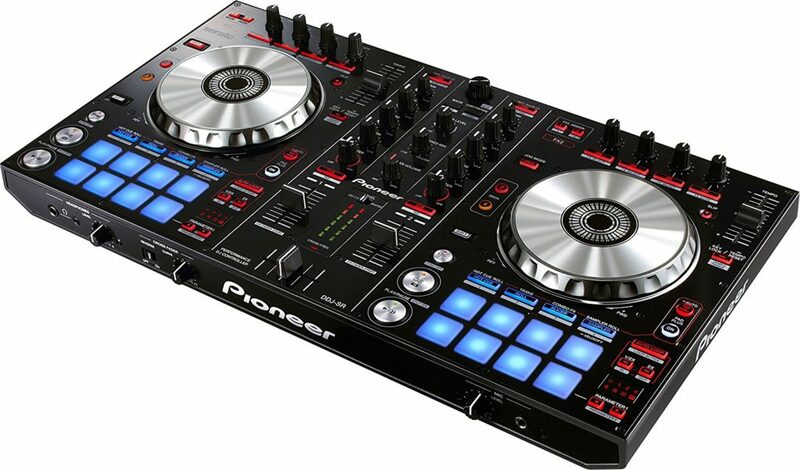 The Pioneer DDJSR is one of my favorite controllers available on the market right now. Everything about it is tailored to creating a one of a kind live show that matches your personality. Whether it’s the rugged construction for carting it off to venues. The portable size without losing usability. The seamless effects integration with playing tracks. Or the unbelievably good sound card that puts out arena sound system quality. You gotta pick it up today.